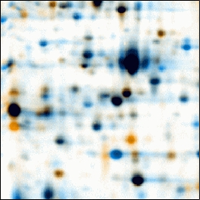 SmartVectors™ is a technology for automatically identifying correspondences between spot patterns on 2D electrophoresis gels. With its ease of use and robustness it sets the new standard for performace in 2D gel image analysis. Delta2D's SmartVectors™ technology uses advanced image processing algorithms to analyze and match whole image regions. The result is expressed as a set of match vectors that connect corresponding spots. In most gel regions these correspondences are perfect, and it is easy to verify them by using warping and dual channel images. Speed: minimizes hands-on time, overall process is several times faster than the previous approach (Delta2D 3.3 with automatic warp). Robustness: works for similar as well as for very dissimilar spot patterns, will only propose vectors where correspondence is highly likely. Intuitive operation: results are easily verified using dual channel images. Easy editing: results can be adjusted anytime by correcting automatic vectors or setting new vectors. For step-by-step instructions, see Using SmartVectors™ Technology in the DECODON Academy area. If you are used to conventional 2D gel analysis packages, you might know those long and tedious editing sessions for spot matches and spot boundaries that were found "automatically" by the software. Most of the difficulties you face with those packages stem from the fact that proteins will migrate to slightly different positions on different gels. Delta2D's image warping eliminates these running differences between 2D gel images. 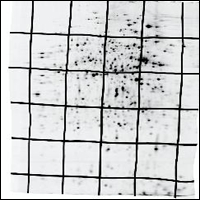 DECODON pioneered the use of image warping in 2D gel analysis with the release of Delta2D version 1 in 2000. Here you see a combined image that is made from two gels. One is colored in orange, the other one in blue. In the dual channel image without warping it is hard to find corresponding spots and do comparisons of expression patterns. Two gel images, overlaid into a dual channel image, not warped. Two gel images, overlaid into a dual channel image, after warping. Differences in expression levels are clearly visible. 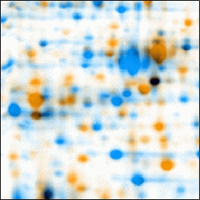 Warping allows Delta2D to assign coresponding image positions across a whole set of images. 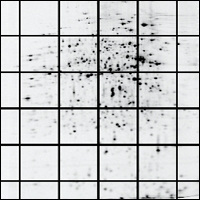 Gel image with overlaid grid. The same gel image after warping. After the warping, the dual channel image gives valuable insight for comparing the spot patterns qualitatively. 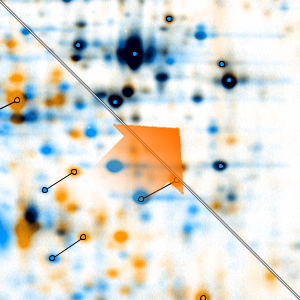 Black means that spots have roughly the same intensity on both images. Blue means a spot is much stronger on gel A, orange means it is much stronger on gel B.